The Part 11 Toolkit facilitates managing security for user groups in MS Access. 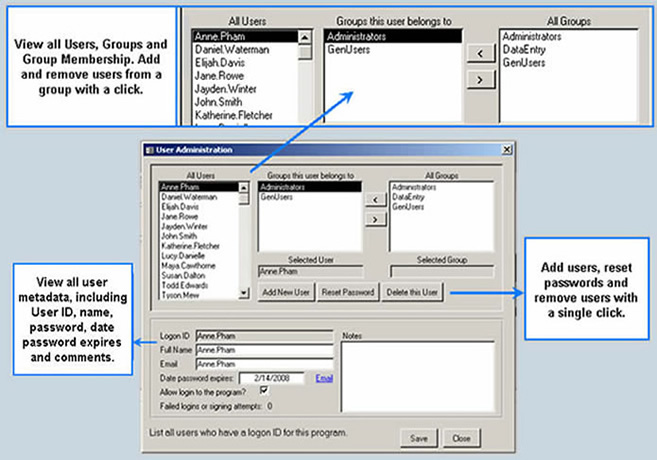 System administrators can view all users and security groups, plus additional user information like name and email. Users can be added to or removed from a security group with a single click. Administrators can also create new users, reset passwords, or remove users from the system. The Part 11 Toolkit works with security defined during system development. Group security is an element of demonstrating compliance with 21 CFR 11.10d, Limited System Access.